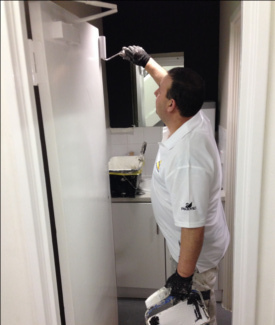 Internal and external specialist retail painting and decorating. Hyden UK offer a nationwide service to attend and carry out professional painting and decorating services. With our experienced retail decorating team we are equally comfortable with undertaking large projects as we are with the smaller ones. Hyden are proficient in carrying out redecoration or remedial works out of your normal trading hours. We appreciate the need to complete the works before your next trading day. We will leave your premises clean and tidy and other than the new look you wouldn't know we had been there. Hyden UK provide a fast professional service and are certain that you will find our costs very competitive. Please contact Hyden UK today on 0845 450 1442 to speak to one of our experienced team and receive a no obligation quote, or make an appointment for one of our surveyors to visit you at your premises. We provide a full range of Retail Maintenance services across the UK.